Dwivedi JS*, Prasad M**, Gupta AS***. There have been reported cases of pubic diastasis. It is a recognized complication of pregnancy. In the modern era, pubic diastasis is rare. It may present in antepartum, intrapartum or postpartum period and might cause serious distress to the patient. Pubic diastasis is defined as the separation or gap between the pubic bones at the symphysis without concomitant fracture. A width of more than 10mm is considered diagnostic. We report a case of postpartum diagnosed pubic diastasis managed conservatively. A 26 yr old, registered, primigravida married since one year, with gestational hypothyroidism presented in spontaneous active labor at 38.2 weeks of gestation. She had regular uneventful antenatal follow up. In the 7th month of gestation, she had undergone treatment with oral metronidazole for Blastocystis Hominis cysts in stools. For gestational hypothyroidism, she was on tablet levo thyroxine 50 micrograms. Pelvis was clinically adequate. Fetus was in the left occipito-anterior position. First stage of labor lasted around 8 hours. She had inco-ordinate uterine activity at the end of 1st stage of labor. Dilute oxytocin was started. Titration was not needed. In view of poor maternal bearing down efforts, after approximately 2 1/2 hours of second stage of labor, outlet forceps application was done, delivering a male child of 3.608 kg with Apgar score of 9/10. Application of the outlet forceps was very easy. There were no cervical tears and episiotomy was uneventfully sutured. There was no postpartum hemorrhage. Few hours post-delivery, the patient complained of difficulty in walking, squatting, lifting of legs and had a waddling gait. She had suprapubic pain and tenderness. Patient was given adequate oral analgesia. The clinical impression of postpartum pubic diastasis was confirmed by radiological findings of separation of pubic bones. 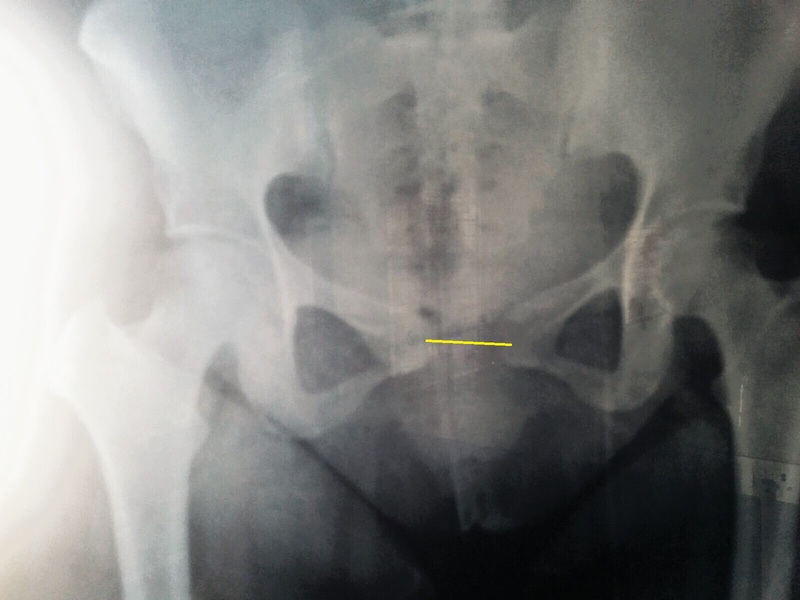 A gap of around 3.5cm on anteroposterior (AP) view of the pelvis was seen at the pubic symphysis. Ultrasonography ruled out retro pubic hematoma. Orthopaedic reference was taken for the same and a pelvic binder was tied. History was reviewed and patient reported using veil constantly, in accordance with her religious tradition. In light of this, bone mineral density (BMD) was assessed using DEXA (dual energy x-ray absorptiometry) scan. Knee, hips and lower limbs were assessed, which revealed normal BMD. Patient was discharged on analgesics and pelvic binder and advised to follow up after 6 weeks. Post 6 weeks of delivery, patient stopped using the binder. X-ray pelvis AP view was repeated in the 7th week. It showed decrease in the gap between the two bones as compared to previous one. Patient was symptomatically better, had a normal gait and had resumed all her daily routine activities. Figure 1. Radiograph of the pelvis AP view at diagnosis. The yellow line shows the pubic symphysis separation . Figure 2. Radiograph of the pelvis AP view after treatment. The red line shows the decrease in the distance between the two pubic bones. An incomplete or a total rupture of the symphysis pubis is known as pubic diastasis. Pubic diastasis is defined as the separation of the pubic bones by more than 10 mm. The first case of pubic symphysis separation during labor was reported in 1932. Pubic diastasis continues to be reported from the developing countries even till recently, following uncomplicated vaginal delivery. While a large number of sporadic case reports continue to be reported, few prospective studies are available which have studied the incidence of this condition. One such study estimates the incidence to be 1 in 385 deliveries. The incidence can range from 1:300 to 1:30000. Various associative factors are fetal macrosomia, cepahalopelvic disproportion and epidural anesthesia. Knowledge of anatomy helps better understanding of this condition. Pubic symphysis is a synovial joint separated by a fibrocartilaginous disc and supported by superior and inferior or arcuate ligaments, which are mainly responsible for the strength of the joint. Experiments have suggested that a force between 400-2600 pounds are required to produce symphyseal separation. The physiological process of joint relaxation starts at around 10 weeks and reaches maximum at or near term, and returns to normal by 4 to 12 weeks' postpartum. Relaxin plays a vital role in the maternal accommodation of pregnancy, which includes pelvic joint relaxation. It is of interest to note that relaxin is recently reported to be related to pre-eclampsia and preterm labor. In case of next pregnancy, the mode of delivery will have to be discussed with the patient due to traumatic past and patient’s fear of recurrence of symptoms. Vaginal delivery can be advised, leaving a choice upon the patient with discussion about prevention and therapeutic possibilities. The obstetrician conducting the delivery should be alert to the recurrence or a gap developing in the sacroiliac joints or a resultant fracture in case the gap widens significantly to prevent instability to the pelvic girdle. In our patient, DEXA scan showed no osteoporotic changes. A report which studied bone mineralization patterns reported an increase in remodeling with bone demineralization in pregnant mothers. Though not reported as yet, we postulate that DEXA scan may help in counseling the patient regarding decision making in the future pregnancies. Aniebeue UU. Symphyseal diastasis following vaginal deliveries: a report of two cases. West Afr J Med. 2008; 27(1): 47 -9. Reis RA, Baer JL, Arens RA, Stewart E. Traumatic separation of the symphysis pubis during spontaneous labor. Surg Gynecol Obstet.1932; 55: 336-354. Saeed F, Trathen K, Want A, Kucheria R, Kalla S. Pubic symphysis diastasis after an uncomplicated vaginal delivery: A case report. J Obstet Gynecol 2015; 31(7): 746-7. Yoo JJ, Ha YC, Lee YK, Hong JS, Kang BJ, Koo KH. Incidence and risk factors of symptomatic peripartum diastasis of pubic symphysis. J Korean Med Sci. 2014;29(2): 281-6. Cunningham FG, Lenovo KJ, Bloom SL, Spong CY, Dashe JS, Hoffman BL,et al, Maternal anatomy. Williams obstetrics. 24th ed, New York, Mc Graw Hill education books. 2014; 32. Snow RE, Neubert AG. Peripartum pubic symphysis separation: A case series and review of the literature; Obstet and Gynecol Surv, 1997; 52(7): pg 438-43. Vrachnis N, Grigoriadis C, Siristatidis C, Vlachadis N, Balakitsas N, Mastorakos G, et al.The Janus face of maternal serum relaxin: a facilitator of birth, might it also induce preterm birth? J Matern Fetal Neonatal Med. 2015;28(18):2187-91. doi: 10.3109/14767058.2014.981804. Epub 2014 Nov 18. Çıçek H, Keskın HL, Tuhanıoğlu Ü, Kiliçarslan K,Oğur HU. Simultaneous Disruption of the Pubic Symphysis and Sacroiliac Joint during Vaginal Birth. Case Reports in Orthopedics. Volume 2015 (2015), Article ID 812132, 5 pages. Available from: http://dx.doi.org/10.1155/2015/812132. Roberts TT, Tartaglione JP, Dooley TP, Papaliodis DN, Mulligan MT, Bagchi K. Preliminary trauma radiographs misrepresent pubic diastasis injuries. Orthopedics. 2015 Mar; 38(3): e229-33. doi: 10.3928/01477447-20150305-62. Gillaux C, Eboue C, Herlicoviez M, Dreyfus M. History of pubic symphysis separation and mode of delivery. J Gynecol Obstet Biol Reprod (Paris). [Article in French] 2011; 40(1):73–6. Available from: http://www.ncbi.nlm.nih.gov/pubmed/20817372 . Martina DM, Biasioli A, Vascotto L, Rinuncini D, Menegato AA, Liva S. Bone ultrasonometry measurements during pregnancy. Arch Gynecol Obstet. 2010; 281(3): 401-7.